After what can best be described as a long but uneventful pair of flights, Ben and Sherie landed at Marco Polo Airport (VCE) in Venice. The Italian Cycling Center (ICC) was our first destination upon arrival, and we expected to see a driver greeting us with a sign as we exited the baggage claim area. However, we did not find the driver Matteo, so we wandered out to the curb. After a lap or two, and still no siting of a driver looking for use, we decided to telephone the number on the info sheet for the hotel. Once we bought a phone card at the shop, and figured out how to use the pay phone, we connected to the hotel just as Matteo found us. (We did stick out as the only two tourists with the large bike boxes beside us.) While we could communicate ok with Matteo, Ben did not quite understand the reason why the police had stopped Matteo in the mini-van for an hour: was it speeding, bad registration, toll road issue, random check? Anyway, Matteo did apologize profusly for making us wait (maybe a half hour) as he drove the most direct route avoiding the Autostrada, probably with the most zigs and zags, to deliver us to the hotel. While we did seem to go in the correct general direction the entire time, we never were on one road for more than a km or two. The hotel itself is in a small hamlet near a bigger town, about ten km diagonally up the sloping fan under a ridge from the bigger town which we had not yet seen. 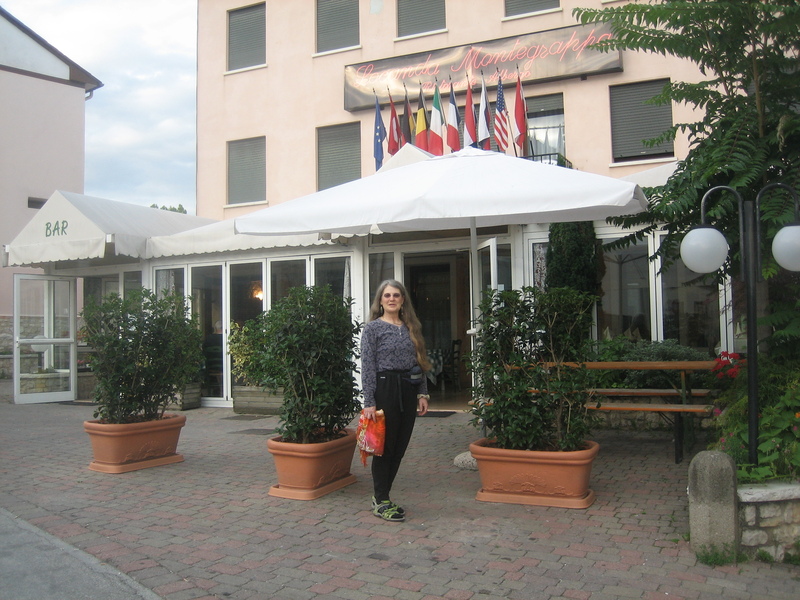 The hotel is in the center of town’s commercial area (two blocks long), in Borso Del Grappa, on a slope rising above the flat Veneto plain. There are views up toward the ridge, green and steep above, and south down toward the plain, with the trees, cornfields and vineyards between scattered settlements. George Pohl, who runs the program at the ICC, organizes the cycling operation and “fronts” the arrangements for the hotel. We will receive 3 meals, a small studio apartment about 500 meters away in a neighborhood, and get to ride with George and other tourists each morning. All for 120 Euro each per day. We have assembled and test driven our bikes, relaxed and napped in our room, strolled through town in the cooling evening twilight, and consummed two meals (mineral water and wine included.) Sherie is a bit more wasted than Ben, feeling the effects of twenty-four hours of travel door-to-door. It might have something to do with the coffee with the airplane “dinner” and watching two and a half bad airplane movies. I guess I slept on the plane a lot more, as I don’t remember much of the movies as I listened to tranquil tunes on the IPod. We shared dinner with George (from Philadelphia) and one other couple (only other ICC guests currently) from Santa Cruz, CA. Mike and Alexis share similar tastes with us; it should be a good ride tomorrow withh them that George has planned. Sherie fears she may be the slowest, but time will tell. I think that George will be our guide tomorrow and be patient and share time with Sherie. We meet for breakfast at 7 AM and start the ride at 8. George says we only need one water bottle, as there is plenty of water to be had in the countryside. I think he is trying to keep our bikes light to make any climbing be that much easier.